Owner Flamur Doku and his family have come to Bristol from Clacton-on-Sea, Essex. Doku does have some background in Bristol, though: while managing a branch of Strada in Birmingham, he was sent to Bristol for three months to oversee the opening of the Clifton branch. After further managerial roles at Brasserie Blanc and Piccolino, he wanted to open his own restaurant but couldn’t find premises in Birmingham or Bristol, hence moving to Clacton and opening the original branch of La Riva in May 2008. The Essex branch was successful for three years but he decided that he wanted to expand his customer base by moving to somewhere larger…and chose a city that he already knew. The Clacton restaurant has now been closed, and the family has moved to Bristol, in order to focus on the new Park Street venture. Although the front of the restaurant is tiny, nestled between the entrance to Niko’s and the Bristol Guild, it certainly makes an impact with its bold red signage. La Riva occupies the former site of the Beijing Bistro, and those who visited in its previous incarnation will know that the size of the front of the building is deceptive. The restaurant, which feels comfortable and modern in shades of red in everything from the comfortable chairs to the bar stools and lights, stretches back a fair distance to hold a large number of tables and a large and very well-stocked bar quite comfortably. After taking our seats, we were handed the menus. Divided, as per the majority of Italian restaurants, into starters, pasta, pizza, risotto, mains and sides, I was pleased to see some dishes on there that you don’t find on the menu in a lot of Italian restaurants that I’ve visited in Bristol: things like a bresaola starter (£6.75) with rocket, Parmesan shavings and lemon, roasted duck (£14.75), and a salmon and lentil dish (£12.95) that sounded amazing! While we decided, we ordered our drinks – wine for two of our party, and soft drinks and beers for the rest, which were served in chilled glasses: a lovely touch. 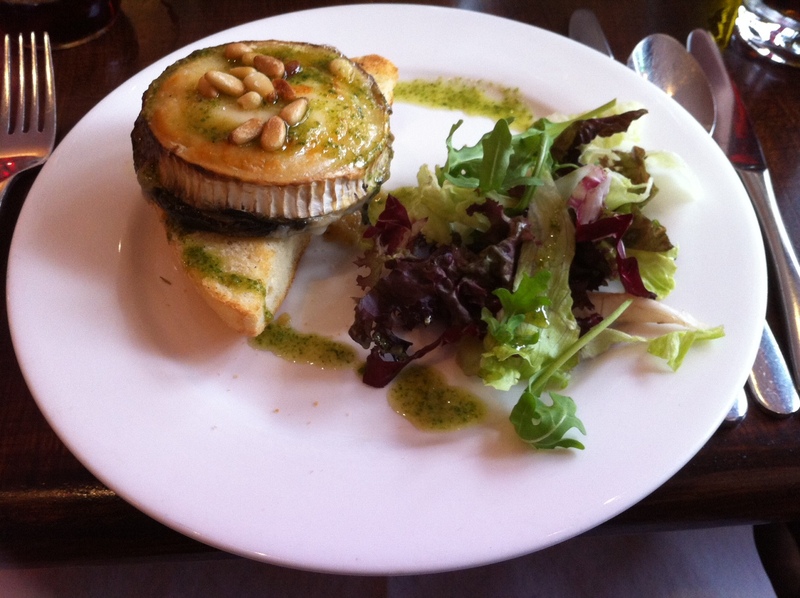 For my starter, I opted for the bruschetta fungi (£5.75) – a triangle of toasted focaccia, topped with a grilled flat mushroom, garlic infused spinach, a round of grilled goats’ cheese and a sprinkle of toasted pine nuts, and served with a side salad and a pesto and olive oil dressing. The bread was lovely, toasted on the outside and still beautifully soft in the middle. It was a great – and traditional – combination of flavours, cooked and presented well, and a decent portion size. Thumbs up so far.. 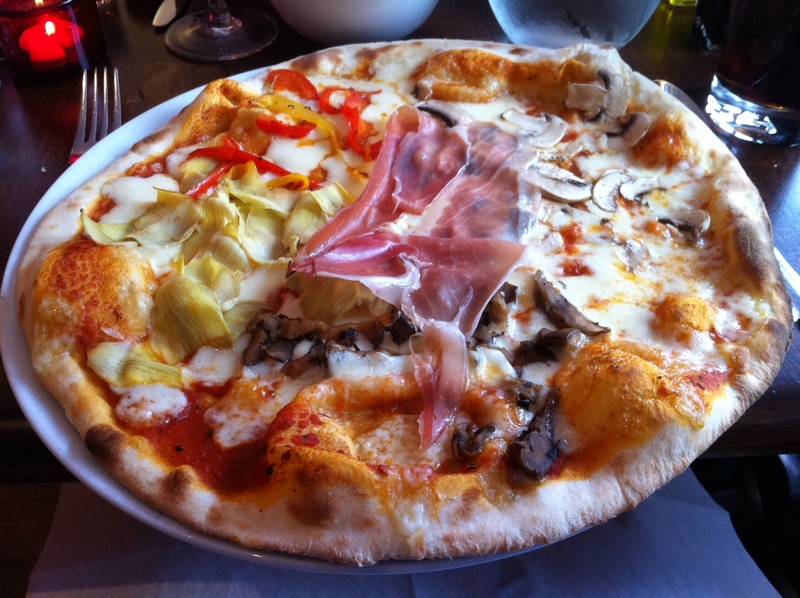 Onto the main, and as others had ordered pasta dishes, I went for a Quattro Stagioni pizza (£9.45): a large, thin base pizza topped with cured ham, artichoke hearts, red and yellow peppers, mushrooms and – interestingly – grilled aubergines. The pizza was enjoyable enough, but could have done with being a little crispier at the edges. I had to admit defeat and pass the rest to a friend as I couldn’t finish it, and she was impressed! The pasta dishes seemed to go down well, with my fellow diners – orders of fettucine alla carbonara (£8.65), linguine ai gamberoni (£11.75) and a small portion of spaghetti alla Bolognese (£4.95) were all quickly demolished. Our other dining companion’s Caesar salad (£5.95 for a small version) was mistakenly assumed to be a starter by the waitress, rather than being brought out with the mains – but when it came to paying, it had been removed from the bill, which was very kind of our hosts. The bill was brought over, and included a 20% discount from a flyer that we’d received, bringing the total to a very reasonable £60 for the five of us. There are still a few teething problems in terms of service that I’m sure will be ironed out soon, but the place has a great atmosphere and the food was enjoyable. There’s also a bargain lunch deal of under £6 for a main, so it’s the perfect place to go for a quick bite to eat if you’re in the Park Street area. Oh, dear. Sounds like ANOTHER average, fake 'Italian' restaurant. 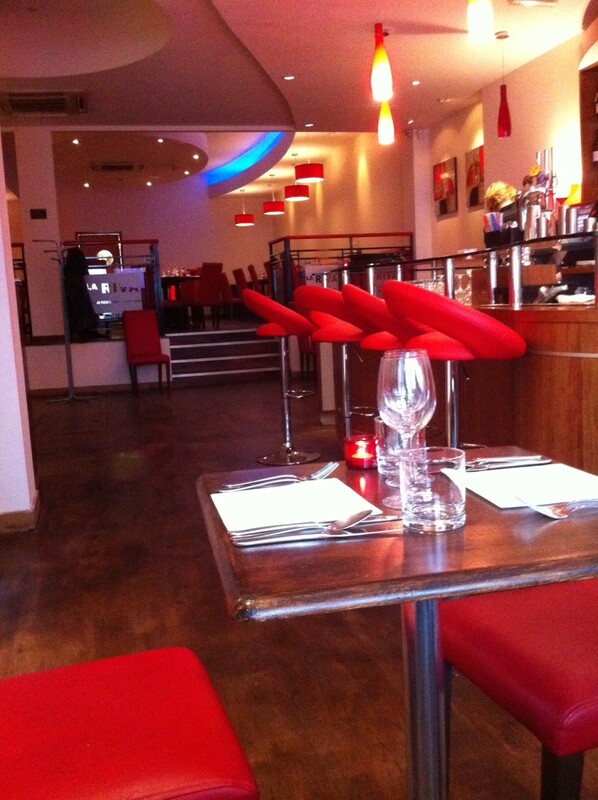 we loved La Riva when it was in Clacton, the food, wine and staff are sorely missed, lucky Bristol! La Riva is an independent Business with a fresh aproach to the restaurant industry! Everything is home made including our desserts! We believe we have the ability to listen and adjust to our customers needs and we aim to do just that! That's great news! Looking forward to seeing the early evening menu too, sounds like a great deal 🙂 Thanks for the comment! Been there last night! Great food, excellent service! My partner and I went to La Riva last night. 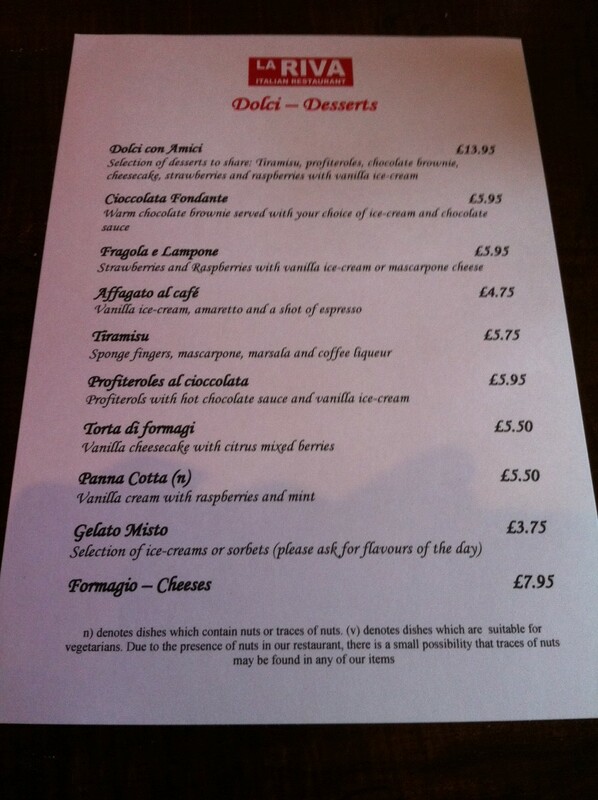 We both opted for the fixed price menu and had calamari fritters as starters, and pizzas for mains. The calamari was perfect and the pizzas were good too (though my pollo parmigiana perhaps could have done with some colour – torn basil leaves?) We were intending to have desserts, but ended up too full! Sorry! The service was friendly and efficient. We'll be back to try some of the other menu options, and hopefully, some of the specials. Since then, I've been back for their lunchtime deal and found it to be good value; I've had their spaghetti Bolognese and a four seasons pizza. Th bolognese was uncomplicated, but rich and tasty. The four seasons pizza was much better than the pollo parmiagiana pizza I had earlier. 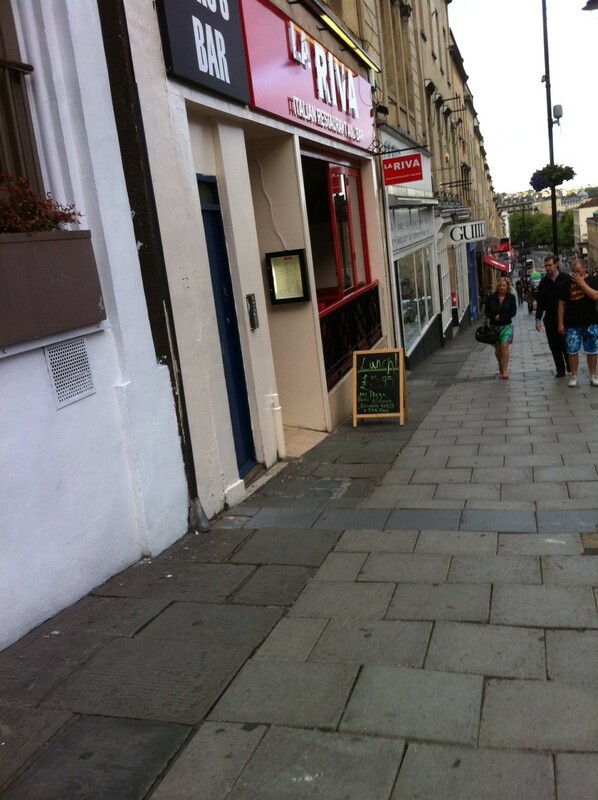 I am Italian and can tell you that this is NOT an Italian Restaurant, just like Jamies Italian across the road. Only real Italians can make Italian food not Albanians or English i.e Jamie Oliver!!! I have been a chef for 27 years, have eaten at many restaurants around the world. La Riva offers great value for real cooked food, not frozen rubbish.